I know everyone was all abuzz about the NY Times recipe for chocolate chip cookies, but I didn't need to try it. Not only would all the cookie dough be gone before it ever hit the oven, but I also already have a favorite. These puppies pack a double whammy--they have a somewhat crispy (but not break-your-teeth crunchy) edge and a fantastically chewy center that only good ol' shortening can provide. I know some folks are averse to consuming shortening, but I think it's downright essential in this cookie. These are not for people who like a fluffy, cakey cookie, which is what I grew up eating (I love you and your fat cookies, Mammicus...). They're quite flat, but still strong enough to support the weight of all that chocolate goodness. Speaking of chocolate, the type that you use is important too. This time around, I used a combination of semi-sweet and white chocolate chips, as well as some chopped up Hershey's Extra Dark Chocolate with Cranberries, Blueberries, and Almonds. Why not? I don't know if chilling the dough for that half-hour really makes a difference, but it's just something I've gotten into the habit of doing. If nothing else, it helps the cookies from spreading ridiculously thin as they bake. I'm sure you all have your favorite recipe for chocolate chip cookies. In fact, I've decided that a person's taste for them is as unique as her fingerprint. Until I stop stubbornly refusing to try a new recipe, this one shall remain my favorite. I took about three dozen to work, and if it's any indication of their scrumptiousness (or perhaps my co-workers' gluttony), they were gone within three hours. This is no small feat, as there aren't that many people in this particular department, and it was 7 in the morning. In a large bowl, beat the butter with the shortening; gradually beat in the sugars until smooth. Beat in eggs and vanilla. Add the flour, baking soda, and salt, and beat into the wet mixture. Stir in the morsels and refrigerate the dough for 30 minutes. Drop dough by tablespoonfuls onto appropriate baking sheets. For best results, flatten to 1/2-inch thickness with a fork. Bake for 8 to 9 minutes or until the edges are golden and centers are still slightly underbaked. Let the little pieces of Heaven cool on the pans for 5 minutes. Transfer to wire racks to let cool completely. Eat at least three while still warm. They're always best that way. Wow, I could almost taste them as I licked my computer screen. Now I have to go change my shirt, I drooled on it. Just loving your miscellaneous additions... and eating at least 3 still warm is a must!! Oooh these look amazing! If I were looking for the perfect cookie my search would no doubt start and end in the US. I mean you guys have cookie dough ice cream so you're really serious about your cookie love! I like your instructions to eat at least 3 before they cool! Best suggestion of the day! I love that Hershey's dark chocolate with the fruit and nuts. I wish you hadn't reminded me! :) Those look so delicious. I think cookies with butter and shortening come out prettier. Can I eat more than three when they come out? Oh good, at least three. I want to be sure to follow your directions! I'm with you on the shortening. I always use it in chocolate chippers. Ooooh, drippy, melty, warm chocolate - we LOVE it!! Now this is what I call decadent :)..I wouldn't be able to stop with just one! I love that picture of the melting chocolate chips. My mouth is watering and now I am craving cookies. I always do half butter and half shortening in my choc. chip cookies, so I'm right there with you! I'm thinking I need to get into the kitchen and make some cookies! One word for these cookie pics ..... YUM! these look great, though. flat and a but chewy, my kinda cookie. Ooh, I wish I was in your office, Chocolate Chip Cookies for breakfast! Yum Yum! Warm cookies are the very best! Your cookies look terrific. I like my cookies the same way crispy edge and a soft middle but I do like mine with just chocolate chips and straight "too hot to eat" out of the oven. BTW, I don't mind eating anything that includes a little shortening to make it better!! Thx for sharing your recipe! I like the changes you made. They look awesome. Glad you tried these, my mouth is watering now!! They look perfect! That gooey chocolate is calling my name...I literally just drooled on my arm... and I'm allergic! I have a bag of the Hershey's Dark under my desk here at work..what a great idea to put them in a cookie!! The gooey shot..omg. I got chills. good grief those pics! sheesh woman!! Love love love the mixed up morsels idea...good thinking! i never thought of it that way but you are right. oh yeah! 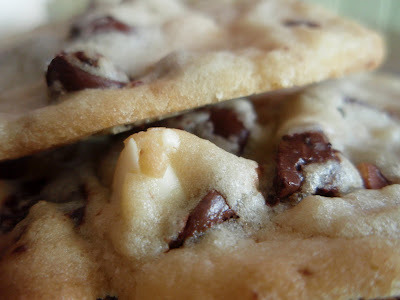 i'm a sucker for chocolate chip cookie pictures with the melty ooey gooey chocolate! I'll eat any cookie that has chocolate chips in it and won't even argue about which is best. I do love a crispy edge w/ chewy center tho, so these sound perfect. I think chilling the dough is a great idea -- it's what keeps those centers chewy. The snail mail really is shipping your book...I promise...should've had Amazon just send it to you. Oh well. Best laid plans, huh? Would it be bad if I licked the screen? I can't stop staring! 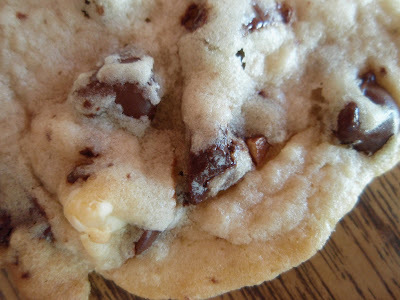 I love chocolate chip cookies, they are my all time favorite. I never get sick of ccc! These look great. Your feeding your coworkers again? I call my Mom, Mamushka, which my Father informs me that this mean fly in Italian. 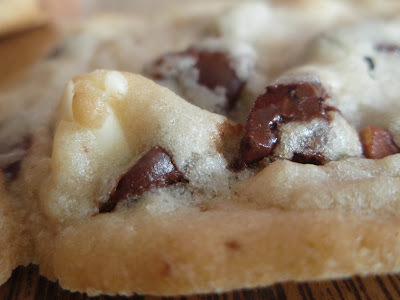 I love a chocolate chip cookie, no matter how its made really. That's the way I like my cookies Grace!!! Oozing with chocolate and chewy!! I'm making these!! That is my kind of cookie! Your way looks pretty darned good to me! I think I need to head to the kitchen right now and make cookies! I've been craving them! 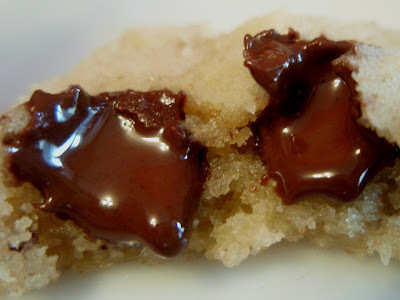 I love the melting chocolate in the picture! These sound just perfect with crispiness and chewiness! Oh. My. Lord. These look so good. I like how you describe the texture as having a crispy outside and chewy inside. I've not used shortening in cookies, but these look so amazing that I'll give it a try "your way"! YUM! These look so yummy! I'm glad you found the perfect recipe! Ok, so call me stupid - I don't get it - why is shortening so much worse for you than butter. You can get zero transfat shortening. Fellow cookie dough addict here... I didn't try that buzzed about recipe either. I tend to pick the recipes that no one else picks... the lonely ones. These look yummalicious. I like your variations w/ the choc. chips. Ah yeah... that description is my cookie quest to a T! They are teasing and tempting me!! Those cccs look so good! Great shot of the melted gooey chocolate! THREE kinds of chocolate - and a super fancy one at that? What's not to love? And by the way, I have to state here also that you have to be one of the most-loved food bloggers out there. You always leave comments and they are funny and unique and people just love you - just look at the number of people commenting on your posts. I love that. You are awesome. Oh my gosh! Those look soooo good! I want cookies now! your photos are so wonderful-and tempting me! i'm going to have to go make some chocolate chip cookies tonight!! I love the color on these. Is it the shortening that keeps them light in color. The shot of the melting chocolate...wow...wow. These guys look like they're ready to be dunked. They look so moist and delicious :). these are stunningly delicious. wanted to make them today, now I feel even more compelled. BTW, thanks for visiting. Ohhhhh yes! Hey is these are your favorite..there is no need to change! I want these cookies now..I like that hard outside/soft inside thang...may I have another? The NY Times cookies may be perfect but I still scour every cookie recipe I come across - you know, for those days that I don't want a cookie I have to chill for 36 hours, the size of my head. Ah Grace, you know my every whim.. I'm always trying new choc chip cookie recipes, but my good old faithful standard also has 1/2 c butter and 1/2 c shortening. It's the only way to get that crispy edge. These look so good, that i want to reach through and grab them! I love chewy chocolate cookies. And what timing.. I haven't baked c.c.c. 's in ages! grace, your chocolate chip cookies look they are really the best! yummm! Love the ooze and the goo - and the light color of the dough! As for the NYT cookie - they are truly nothing special, believe me. PLUS, you have to leave the dough in the fridge for like 2 days - HOW DO YOU THINK THAT FEELS FOR A DOUGH ADDICT? Exactly. Thanks for sharing your recipe.. This looks like something i can adapt to any "miscellaneous morsels" I may have lying around. "I'm sure you all have your favorite recipe for chocolate chip cookies" - hell yes - THIS ONE! I agree that shortening is juts necessary sometimes. And those melty choc chip shots... could they get any p0rnier? Fantastic.